In reaction to this issue I created a concept for the board game in Blender. It's far from finished. There is no main pawn yet, and I want to add more decorative items. Like the money or puzzle pieces in the original game. I thought I post it here as well, so you can give comments and tips for improvements. Definitely looks nice. I look forward to seeing this (with a nice board texture) in the game. I'm no artist myself so I'm not going to be much help in this area. I finished this scene. I hope you guys like it. I drew a texture for the board in Inkscape. I'm not sure if the level names are correct, so if someone could check them, that would be nice. The animation still has to be done. The main pawn wears a stethoscope as a reference to the junior doctors in the game. At level 4 a suitcase is added and in level 8 he becomes a consultant an he gets a car. The rat mini-game is represented by the rat extermination advertisement next to the board. The helicopter next to "largechester" means that the emergencies start from that level. (I believe this is like the original). The UFO next to "Croaking" means that aliens start in that level. Does anyone know if there are more events like this and when they start? And lastly how do you write Corsix-TH correct, with of without a hyphen? And which characters should be capitalized? This should be in the game!!!!! 1) Could you make a version without the names? The level names are translated to something else in at least some of the translations (the original ones for sure, and the new ones where the translator was feeling creative enough). Thus the town names on the board are misleading. The rat ad on the other hand is okay in my personal opinion, since the text (or the part of it that's readable anyway) is not needed to convey the meaning but only flavor. Theoretically it would be preferable without any text, but in this case it's just not doable, I think. 2) I already had this thought when I saw your previous image, but couldn't lay the finger on it; however now I know what it was: The syringe is looking too dangerous for a toy imo. It looks as if you could really pierce someone's skin with it. Maybe make the needle thicker and cut off the end before it becomes too pointy. I mean, looking at it from a toy manufacturer's view, this would mean that it's both easier to make and less likely to break. 3) I love what you did with the jigsaw puzzle. People who know will have a good laugh, and others won't even notice your little easter egg there However I believe that you've used the original base graphics there, which is a no-go if we want this included in CorsixTH. Please use the OpenGFX base set and to be absolutely safe contact the authors for permission to use a screenshot of their work in a derivative work - or else you probably would be forced to release it under GPL, which is what I think they are doing with their base set. In any case please also make a version without a pawn, that we could include as a static image - this can double as a level selection screen that some people have requested. Level names could be displayed there localized in form of tooltips. 1) I will delete the names. I added them because they didn't play a big role in the original game and I really like them. I didn't think they would be translated because I checked the language .lua files and I couldn't find them. 2) You're right about the syringe. When I was modelling the needle I wanted it to look like a needle and I forgot I was actually modelling a toy. 3) I thought about the license on the jigsaw graphics so I took a screenshot form the 1.0 section on there site. Since version 1.0 came with the OpenGFX set I thought all the screenshots in the 1.0 section used it. After reading your reply I checked the image again and maybe it is the original set after all. To be sure I will make a screenshot myself and contact the developers. I will also check the rat extermination image. I like the name with the hyphen more, but if "CorsixTH" is the correct way I will go with that. Now in reply to your concern about the suitcase and the car: Don't worry! I worked on the car a little this afternoon and it's starting to look great. I have a lot of ideas for animating this scene but since I'm not going to be coding it I don't know what the requirements are. In what file format and resolution should I render the animations? Are there limitations to the file size of the animations? 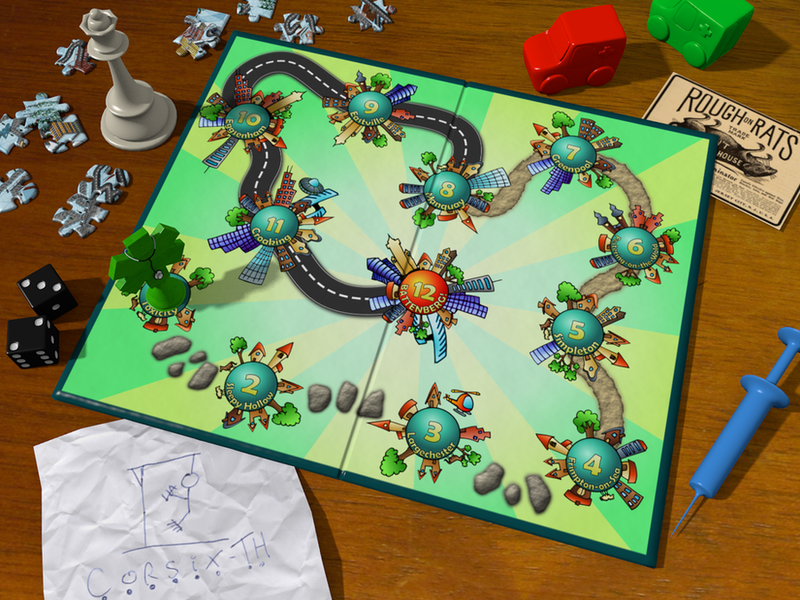 I only created one place for the mini-game but the original board had two. should I create another one? I have an idea to give the pawn an "inspector gadget" helicopter gadget to fly to the mini-game. this can also be used for the future level selection, where the pawn can fly to the selected level from outside the scene. Would this be overdone and a waste of hard disk space or do you think it's a good idea? If I do this there will be 12 animations for reaching each new level, one animation for the mini-game and 12 animations for the level selection. It really looks great! :-) May I suggest that the pawn takes the shape of a "normal" cross? Since the CorsixTH logo (at the moment) uses that shape? As a first step I'd say that a background and a pawn (or three versions or if) by itself would be sufficient to make some kind of screen. It depends on how much planning is needed for a new animation format. If it's possible to do directly that's of course the best way. Looks amazing! It's nice to have this kind of a visual progress meter. It solidifies the feeling that you're working towards an ultimate goal. I must say it does look very very good. I don't think losing the names will be too bad, as they do feel a little squished in. I think the pawn itself is my favourite bit and I look forward to seeing how you're adapting it for the doctor and consultant roles. Hello everyone, thanks again for the positive reactions and the enthusiasm. I worked out two of wolfman's comments but I haven't changed the jigsaw puzzle texture yet. I also modelled a briefcase for the doctor and a car for the consultant. @lego3: The first version of the pawn was a normal cross but I changed it because it looked more like some sort of religious cross. This was due to the (relative) tall base and the viewing angle. I also think it looks nicer because the shape is less standard. I would really like to go with the current model so I hope you don't find it to bad.